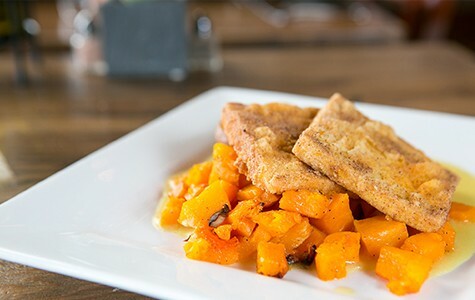 Sanctuary Bistro offers food that's vegan and gluten-free, but might leave you hungry for more. 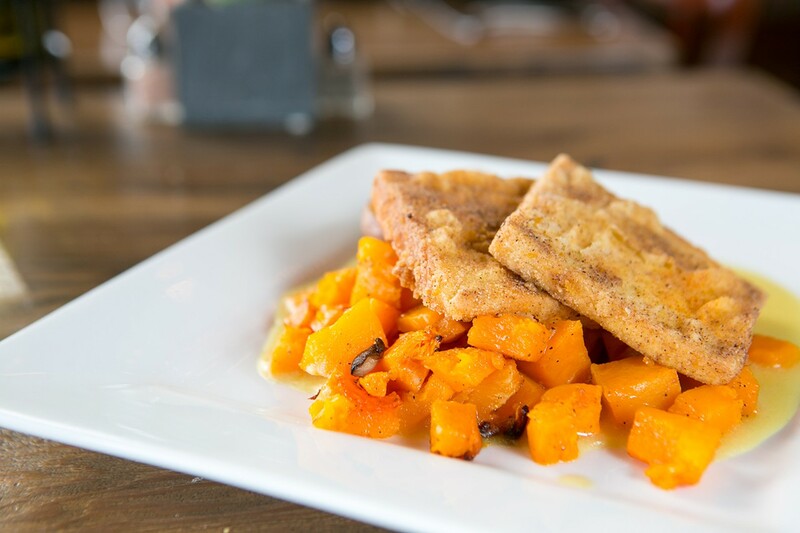 Sanctuary's fried Hodo Soy tofu and roasted butternut squash. Hours: Mon., Wed.-Fri. 11 a.m.-3 p.m., 5:30-9 p.m.; Sat.-Sun. 8:30 a.m.-3 p.m.; Sat. 5:30-10 p.m. There are many ways to describe the new vegan restaurant tucked away in West Berkeley, but this one is probably the most concise: Sanctuary Bistro might be the amalgamation of nearly every stereotype that a certain kind of smug East Coaster has about food in the Bay Area. Not only is the food at Sanctuary vegan, it's also gluten-free — a daunting combination that has led to a menu chock-full of neologisms such as "nach-oat cheese" and "Rawlmond Joy." A note in fine print explains that because the produce in the restaurant is 100 percent organic, diners might expect an occasional "uninvited guest" at the dinner table, by which they mean bugs. The menu advises diners to inform the staff if this happens, so that the "garden friends" can be set free outdoors. 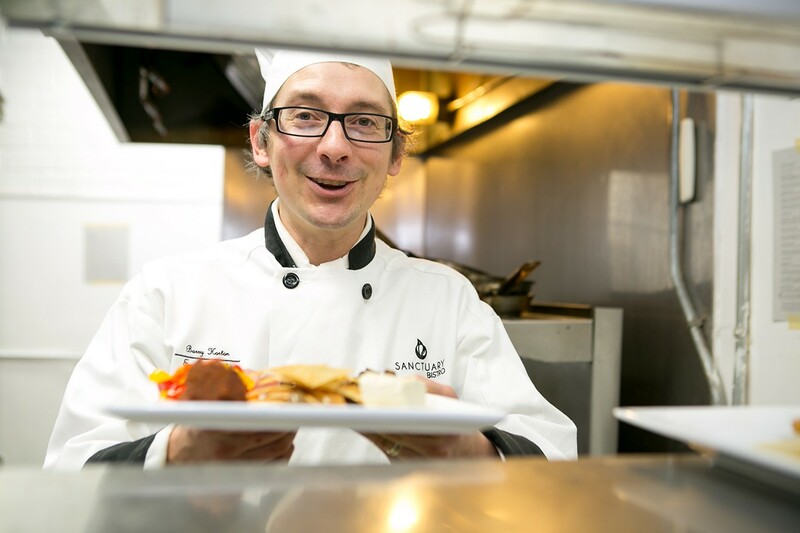 Chef Barry Horton and his wife, Jennifer Jones Horton, have been vegan for the past seven years, and their family adheres to a gluten-free diet, too, because Jones Horton suffers from celiac disease. 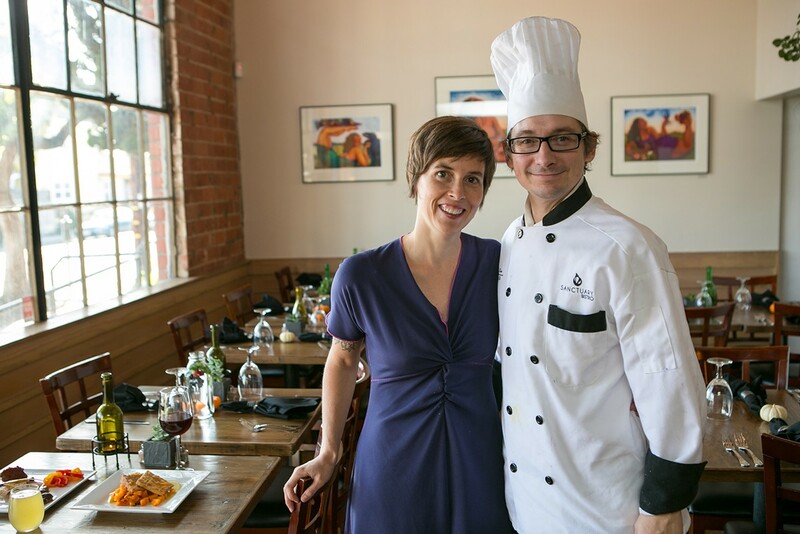 Horton said the idea behind Sanctuary was to create a "fine dining" experience for vegans — not quite white tablecloths and elaborate tasting menus, but a step up from the granola-hippie vibe of your average slinger of quinoa bowls. 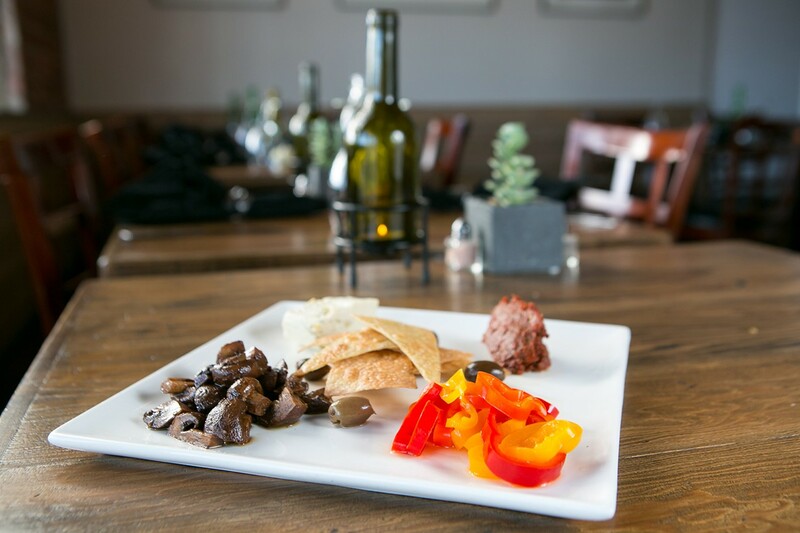 Servers wear black pressed shirts and matching aprons, and carefully deliver fresh forks for your next course from a fancy-looking silver platter. An abundance of air plants and potted succulents create a desert oasis effect, and on a recent Monday evening, two women played a weepy harp-and-violin arrangement of "Every Breath You Take." Horton said he always tries to make Monday nights special, in part to appeal to non-vegans who might be trying out "Meatless Mondays" — an increasingly fashionable practice among the health-conscious and sustainability-minded. During my Monday visit, dinner started with a complimentary amuse-bouche of tomato "sushi," a nigiri-like creation that showcased a slice of tomato — cooked sous vide, by the San Francisco-based startup that created the product — whose texture and appearance mimicked that of raw tuna remarkably well. Although Horton said he wasn't particularly interested in creating vegan imitations of meat dishes, the menu makes plenty of those references: "crabless cakes," "no-chicken salad," and so forth. How you feel about these dishes will depend on your frame of reference. A seasonal, savory eggless soufflé, for instance, consisted of chunks of zucchini in a thick, creamy sauce, and didn't much resemble a soufflé at all. But if you viewed it as a hot dip or a vegetable "cheese" fondue, the soy-based concoction was reasonably satisfying. On the other hand, if you're a fan of traditional shepherd's pie, you'll likely find the lentils in Sanctuary's meatless version to be a poor stand-in for ground lamb. If you're looking for something more akin to a lentil-and-vegetable soup, topped with whipped potato? You'll probably still find this version rather bland. The "pie's" soupy insides were undersalted and lacked the heavy dose of winter spices that give the dish its warming, comforting quality. By comparison, the pan-fried tofu — a take on Southern country-fried chicken — packed a flavorful wallop. Hodo Soy tofu had been dredged in rice flour before it was fried, and was served with roasted butternut squash and a twice-baked potato topped with shiitake "bacon" — mushroom slices baked until they had the smokiness and saltiness of pork bacon, if not the crunch. Most delicious was the super-savory "country gravy," which Horton thickens with a roux made using a house-made butter alternative. For $18, though, I'd have loved a little more tofu than two thin slices. Sanctuary's other signature dish is the Artisan Plate, which is Horton's version of a cheese or charcuterie plate and features a mélange of pickled, marinated, and cured vegetables; flax crackers; and, most impressively, a cashew-based lemon-pepper "chèvre" that was so creamy and tangy it was almost indistinguishable from the real thing. But often, the food just felt overpriced. The Harvest Salad ($9) was little more than a pile of overdressed greens decorated with a few apple slices and a handful of dried cranberries. Even disregarding the fact that the toasted pumpkin seeds listed in the description were absent, a vegan restaurant should be able to serve a more abundant salad. And a $5 side order of the aforementioned shiitake bacon came in the kind of tiny tub reserved for a dipping sauce. To drink, the restaurant offers two rotating kombuchas on tap because, well, of course it does. The strawberry mint flavor turned out to be refreshing and quite enjoyable — crisp, fizzy, and slightly vinegary. There's also a large selection of vegan wine and gluten-free beer. Meanwhile, the traditional American breakfast is such an egg, pork, and wheat-based affair that, to the typical omnivore, Sanctuary Bistro's brunch menu might read like a cruel parody: "Yes, I'll have the pancakes, but could you please hold the eggs, buttermilk, flour, and butter?" The gluten-free chocolate-chip waffle ($9 for one!) was crisp and not unpleasantly chewy. The problem was that the waffle itself (made with brown rice flour, tapioca flour, flax, and water) had little discernible flavor, so there was nothing to offset the sweetness of the chocolate. Much better was the huevo-less "Ranchero": two corn tortillas topped with a moist polenta (or tofu, if you prefer) "scramble," black beans, and a tomato salsa that I wished had more kick. This came with breakfast potatoes and a pile of plain (completely unseasoned) braised kale that, depending on your point of view, was either the best or worst thing on the plate: Nothing at all interfered with, or supplemented, the earthy, natural sweetness of the greens. I went home filled with, if not the turbocharged strength of a spinach-powered Popeye, then at least the sense of wholesome virtue I often feel after a healthy, meatless meal. But a few hours later, I was hungry again.